Vauxhall’s new Mokka X, which reaches UK showrooms late this year, will debut at the 2016 Geneva Motor Show next month with a fresh interior and exterior design, a new powertrain and featuring OnStar and Apple CarPlay. With over half a million sold in Europe and nearly 100,000 in the UK, Mokka has been huge success since its launch in 2012. The Mokka’s compact size (4.28m long), sporty looks and elevated seating position having wowed customers looking for an affordable SUV. 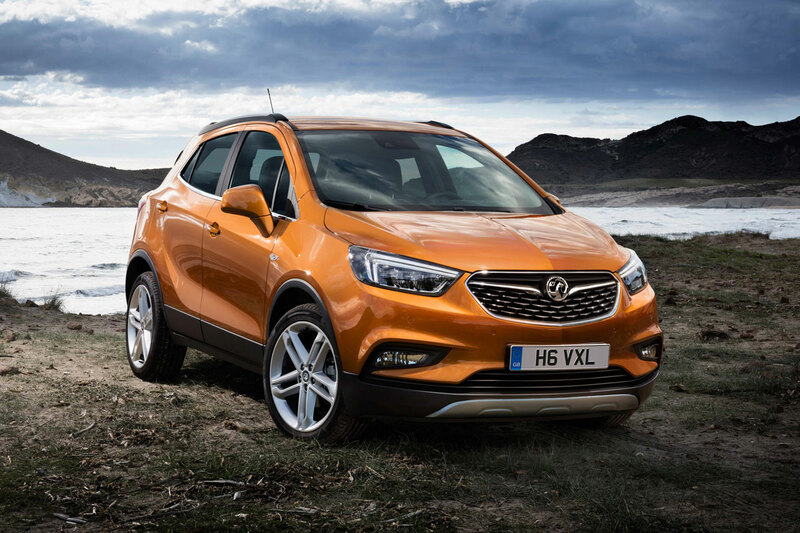 The Mokka X’s bold new look is thanks to work carried out by a design team lead by Brit Mark Adams. Its new front treatment is aligned with Vauxhall’s new design philosophy including a wing-shaped horizontal front grille and the dominant, sharp double-wing signature of the LED daytime running lights. The front fascia gets precise and elegantly sculpted surfaces, with fewer plastic inserts. This gives the Mokka X a wider, more solid and muscular stance. It is continued at the rear with another double wing signature highlighted in the tail lamps, with LED technology an option. The body side retains sporty edge with powerful and athletic lower body lines, energised by Vauxhall’s typical ‘blade’ that sweeps upwards to the rear. Vibrant new colours such as ‘Amber Orange’ and ‘Lava Red’ will also be available. On the inside, the Mokka X has a completely new dashboard inspired by the new Astra. The new instrument panel is organised around more horizontally shaped elements. It looks both simpler, as well as sharper and more precise in its execution. The centre stack has been redeveloped completely around the seven- and eight-inch touchscreens of the new generation infotainment systems. Now with fewer buttons, it has many functions that are accessible via the touchscreen. 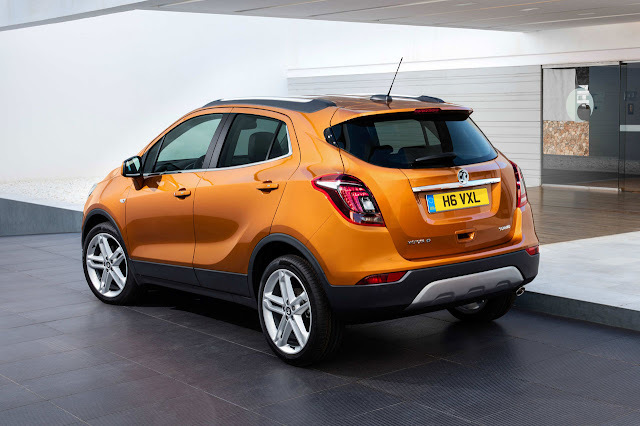 After introducing the much-lauded 1.6-litre ‘Whisper Diesel’ engine last year, the Mokka range is now extended further to include a new generation 1.4-litre Direct Injection Turbo (152PS) petrol unit which first appeared in the all-new Astra. With a six-speed automatic transmission, adaptive all-wheel drive and start/stop, this Mokka achieves 42.8mpg* and CO2 emissions of 154g/km*. With an electro magnetic multi-plate clutch, the all-wheel drive technology is clever and efficient. When the road surface is dry, the front wheels drive the vehicle forward (except when starting when the car is in AWD) meaning that fuel consumption remains low. Depending on the road conditions the range automatically and seamlessly varies from 100 per cent front-wheel drive on dry road surfaces, benefitting fuel consumption, to a maximum torque distribution of 50 per cent on the front- and rear- axle, for example, when roads are covered in water. In addition to the AWD system, Vauxhall engineers have once again followed the strategy of making innovative technology available to a broad group of customers by introducing LED Adaptive Forward Lighting headlamps. The new AFL LED system adapts the headlights’ lighting patterns automatically to the driving situation so that the best possible light performance is given without dazzling other road users. It features nine different functions/lighting patterns such as town light, country light, tourist mode, a curve and cornering function, backing-up/manoeuvring light and a stop mode light (eco). This LED system replaces the previous BiXenon AFL. On one hand, LED features a light quality that allows seeing the ‘true’ colours of things, to the benefit of visual comfort. In addition, as there is no mechanical operation within the lamp module, it is faster and more accurate in its reaction, while also being highly reliable over time. The new Mokka will be available with the personal connectivity and service assistant OnStar from launch. Drivers and passengers can reach OnStar 24/7 and 365 days a year. No matter whether they need roadside assistance or any other service, an OnStar advisor is always ready to help. OnStar also turns the Mokka X into a 4G LTE mobile Wi-Fi hotspot. Up to seven devices, from smartphones to tablets, can be connected simultaneously. In addition, two versions of the new generation IntelliLink infotainment system will make their debut in the Mokka X. IntelliLink brings the world of smartphones to the car via both Apple CarPlay and Android Auto phone projection. 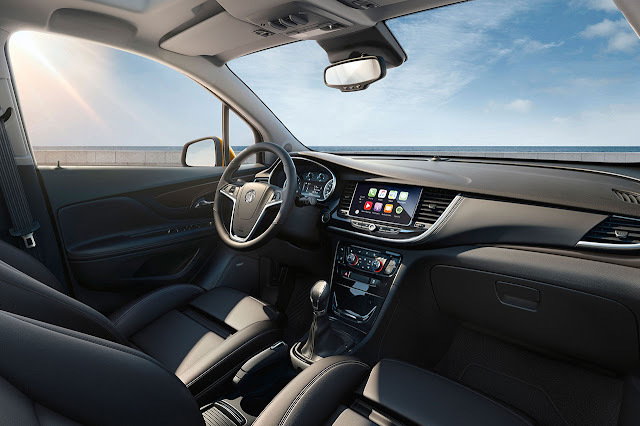 As well as being the best connected car in the compact SUV segment the new Mokka X can also claim to be one of the most comfortable. Like in most Vauxhall models, the AGR (Campaign for Healthier Backs led by independent back health experts) tested and certified Mokka X’s ergonomic seats, which are unique in this segment, making long highway journeys just as enjoyable as excursions onto rough terrain.